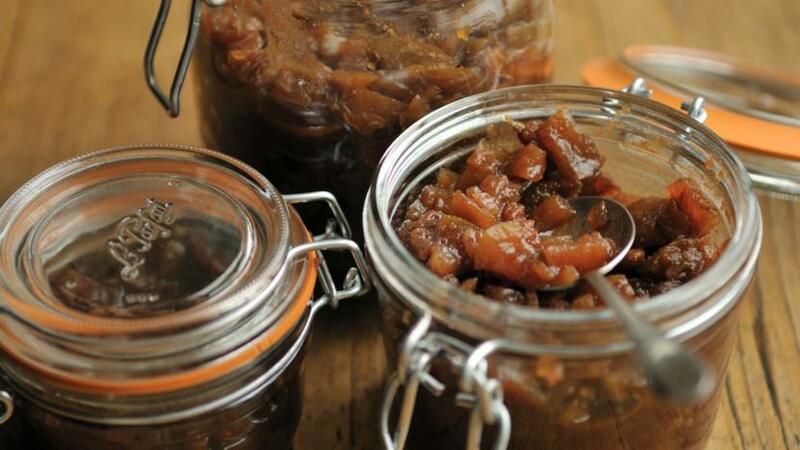 This apple chutney has a tangy, sweet flavour which is perfect with cheeses such as cheddar, cheshire or white stilton. Put all the ingredients into a preserving pan. Slowly bring to the boil until the sugar has dissolved. Simmer for 1½-2 hours, stirring from time to time to stop the chutney sticking to the pan. When it is very thick and you can draw a wooden spoon across the base of the pan so that it leaves a channel behind it that does not immediately fill with liquid, the chutney is ready. Turn into sterilised jars, seal and cool. Store in a cool, dark cupboard for two to three months before eating.